When it comes to famous paintings, Leonardo da Vinci’s Mona Lisa is arguably the most visited piece of art in the world. Located in the Louvre in Paris, France, the painting is constantly surrounded by tourists and art lovers. The Mona Lisa has been on display at the Louvre since 1797. So many people are drawn to Mona Lisa’s secret smile and intrigued by the way her eyes seem to follow your every move. Many things remain unknown about da Vinci’s Mona Lisa. When it was painted is a mystery as well as he true identity of who Mona Lisa really is. There is a theory that Mona Lisa is really Leonardo da Vinci as a woman. Recently, most experts have come to the conclusion that Lisa Gherardini is Mona Lisa and that da Vinci started the painting between 1503-1506. One thing that is known is that the painting took many years to complete and that it was started in Florence, Italy. Leonardo da Vinci was a perfectionist that believed his works could always be improved and were never finished. A fun fact about the Mona Lisa is that it was once stolen from the museum. It was stolen on August 21, 1911 by Vincenzo Peruggia, a Louvre employee. 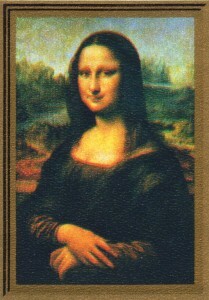 Before the painting was stolen, da Vinci’s Mona Lisa was little known. The Louvre was closed for a week to allow investigators time to work. Once the museum reopened, people flocked to see the empty spot. By stealing the Mona Lisa, Vincenzo thrust the painting into the international spotlight and is hasn’t been far from it since. For 2 years, Vincenzo kept the painting hidden, but he grew antsy and tried to sell it to the Uffizi Galleria who called the cops and he was arrested. When he was asked why he stole the painting he claimed that he was trying to return the painting to where it belonged, Florence, Italy. In addition to being stolen, In 1956 someone damaged the painting by throwing acid on it. Also in 1956, Ugo Ungaza Villegas threw a rock at Mona Lisa, chipping the painting by her elbow. So while you are in Paris, go take a look at the most visited piece of art in the world and see if you can figure out what Mona Lisa is slyly smiling about while her eyes follow your every move. It is a beautiful piece of artwork and a sight you should not miss. Our 2014 trip dates have been posted to our website with early bird discounts of up to $300 if you book and pay by October 31st. So, what are you waiting for? This entry was posted on Thursday, September 19th, 2013	at 3:34 pm	. You can follow any responses to this entry through the RSS 2.0	feed. Both comments and pings are currently closed.